AptaraDirect is a fast and simple way to digitize your content and make it mobile — hassle-free. Distribute to Amazon, Apple, Barnes & Noble, Google, Kobo, OverDrive — and your own website. AptaraDirect empowers authors and publishers a streamlined method for creating and distributing digital content. Our service allows anyone to convert source files for viewing on virtually any eReader device or app. This includes the Apple iPad, Amazon Kindle, and Barnes & Noble NOOK, among many others. Our expertise in eBooks is second to none, so your files are in trusted hands. 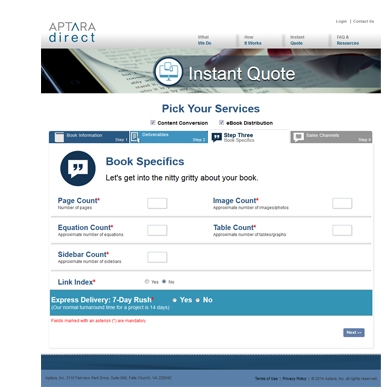 AptaraDirect also handles eBook file delivery for sale. We provide information about your book and check off the channels you want to distribute to; we take care of the eBook you wish to sell, as well as the metadata that it needs to hit storefronts. Most importantly, when you sell your eBooks, you keep all your earned royalties. 100%.